Jim Pateras of EM & J Pateras farms a 55 acre horticulture property in Weeribee Victoria growing cauliflowers. 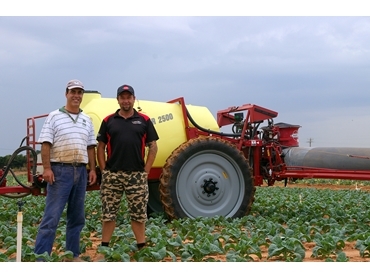 Jim recently purchased a Ranger 2500 TWIN stream sprayer from HARDI Australia to save time and to make spraying easier. “The 2700 litres suits me very well. I’m now doing less fill-ups, but it’s easier to manoeuvre than my old linkage sprayer because it just follows the tractor,” said Pateras. An A-frame connected to the Linkage arms of the tractor with an articulation point approximately half way between the tractor and trailer axles, is the track following steering drawbar. It is this drawbar design that allows the trailer to follow the tractor in and out of the rows in exactly the same wheel tracks as for the tractor. The Ranger 2500 twin stream sprayers are completely integrated sprayers with excellent crop clearance and a low centre of gravity. It has a 1.56 to 2.34m adjustable track width and a Para-lift controls the boom height to 1.75m. The tank shape provides excellent weight distribution and is designed for effective agitation. A foot step and hand rail makes easy and safe access to the platform. A curtain of air, evenly distributed from under the boom carries the spray droplets to the target reducing drift and increasing coverage. Water rates can be reduced from conventional volumes which means less water cartage and less filling time. Better coverage, penetration and a higher on target dose rate gives a better result for the chemical. The concept of Twin Stream sprayers guides the spray drops with air and avoiding drift. The air speed and delivery angle of the air curtain are controlled by the operator to suit the spraying conditions or to significantly increase the coverage and penetration into the canopy. Spray angle can be adjusted from 40˚ forward to 30˚ rearward. The manifold fluid system has colour coded valve position icons to make operation easy. Pressure regulation and boom section valves are operated from the tractor seat with the SprayBox remote control. The 250L rinse tank makes it quick, easy to flush the sprayer at the end of the day or between treatments.